This morning I have been hard at work using up some of the glut of windfall apples, kindly donated by one of Mr Shoestring’s neighbours. They are a mixture of eaters and cooking apples. Because they are windfalls and bruised in places, they won’t store, so they need to be used or frozen. I have made a simple but delicious Eve’s pudding for tonight’s dessert. This worked out at 16p a portion, but will obviously cost a bit more if you buy the apples. Try them in season from the market, where they will be cheapest of all. The other prices are all based on what I paid at Aldi, apart from the brown sugar, which came from Asda. 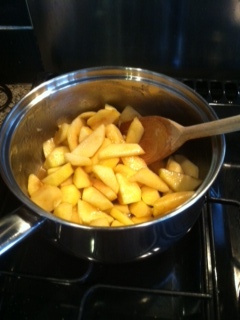 Soften the apples by melting the butter with the sugar in a saucepan, and then adding the apples. This takes about 10 minutes. Make the sponge by creaming the butter and sugar together until the mixture becomes pale yellow, then whisk the eggs in one at a time. 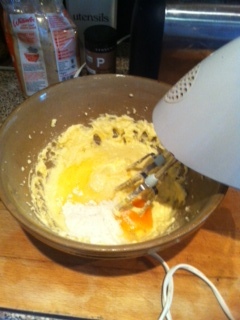 If you add a spoonful of the flour in with the second egg, this will stop the mix from curdling. Finally mix in the flour and stir until all of the ingredients are well blended. Place the apples on the bottom of a suitable greased tin, making sure you drain off most of the juice to prevent your sponge going soggy. 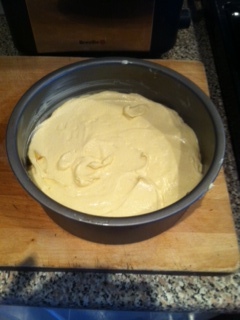 Then add the sponge mixture and spread it evenly. Place the tin in the middle of a preheated oven, at about 180C/gas mark 4 for about 45 minutes. I am looking forward to this! I have also made several portions of spiced apple puree for the freezer. I just add 3 oz of brown sugar and a couple of teaspoons of mixed spice to about 1lb of apples with 2 teaspoons of water and simmer gently for 10-15 minutes. Cool, then bag up or put into containers. You can eat it as it is, with yogurt or custard, or as a base for a crumble. We are also having a super frugal vegetarian dinner of chick pea curry and rice. You can find the recipe here. Jane, I am cooking my way through two boxes of apples Mum and I bought from a man who brings them here (Edmonton, Alberta) from B.C. (where we are from) One box is MacIntoshes, which cook right down into sauce; the other is Galas, which cook beautifully and retain their shape. I like to mix them so there is sauce and shape . . . Your frugal pud is the antidote to my choc meringue extravaganza the other day!